Looking to reduce wrinkles around the delicate eye area? Minimize dark circles? Dr. Joel Schlessinger recommends his favorite three eye creams. One of the best eye creams available, the doctor explains, is Obagi ElastiDerm Eye Treatment Cream, which visibly lifts the skin around your eyes and works to restore skin elasticity in as little as two weeks. You’ll love how much firmer and more resilient the skin around your eyes will become and you’ll love the reduction in visible fine lines and wrinkles. Thanks to the Penetrating Therapeutics technology of Obagi, the copper malonic acid in this cream can help to nourish the growth of new cells deep into the skin while the blueberry extract provides antioxidants that fight free radicals. This is a rich cream with a smooth consistency and should be used twice a day; it’s ideal for normal to dry skin. Another excellent choice is Neocutis Lumiere Bio-restorative Eye Cream with PSP®. Neocutis Lumiere Bio-restorative Eye Cream is an ideal choice when you need to minimize dark circles beneath your eyes. This product is soothing and refreshing and it softens the appearance of fine lines and wrinkles. It’s a rich cream and, when used regularly, you can see results as quickly as six weeks. Hyaluronic acid in the cream provides hydration, while the PCP® helps to prevent premature aging; caffeine helps to reduce puffiness and dark circles — and the combination of these three ingredients work together to reduce the signs of fatigue. This eye cream is fragrance free, gluten free, PABA free and color-additive free. 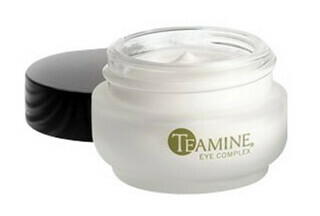 Dr. Joel Schlessinger makes one more eye cream recommendation: Teamine Eye Complex. 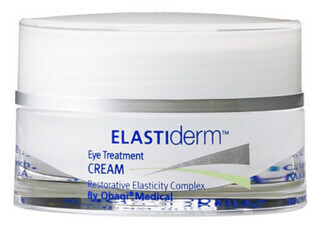 This is one of the most popular eye creams at LovelySkin.com for reduction of under eye circles. This light, creamy, fragrance-free product helps to firm and tighten your skin, which reduces the appearance of fine lines and wrinkles. Plus, your complexion can be brightened by the light-diffusing technology of the cream. Ingredients include vitamins K, E and C, plus green tea extract. This product works well with any skin cream regimen. When Dr. Joel Schlessinger was asked for his 3 favorite cosmetic brands, he couldn’t – because he also needed to give a shout out to a fourth brand. jane iredale: this collection contains oil-free formulas and broad-spectrum sun protection in its healthy mineral cosmetics. Each product has been carefully developed so that it is actually good for your skin; you can select from products that highlight your complexion (jane iredale contains pressed foundation bases, loose powders and liquid mineral makeup), eyes, cheeks and lips. Colorescience: the Colorescience Pro mineral makeup line features a lightweight, water-resistant formula that is safe for all skin types – and these products do more than just make you look beautiful. They also help to remedy and conceal fine lines, wrinkles, redness and blemishes. Products include powder sunscreens and mineral foundations; primers; eye colors; and lip treatments. glo minerals: these products combine pharmaceutical-grade ingredients with pure natural pigment minerals, plus an advanced blend of antioxidants and vitamins to protect your skin while helping you to look more beautiful. What’s great about this line is that the colors in these products can be used to create a light sheer look or for full coverage. These products are free from talc, perfumes and chemical dyes. Oxygenetix: this brand is the bonus recommendation from Dr. Joel Schlessinger; note that this line isn’t as large as jane iredale, Colorescience or glo minerals. Its products, though, do an incredible job to help cover, heal and minimize post-procedural scars, stimulate cell growth and rebuild collagen while soothing your skin. You can even purchase foundation samples to make sure you have the perfect match for your skin tone. Be sure to check back in when Dr. Joel Schlessinger recommends his favorite eye creams. Wondering about the best cleanser for your face? Dr. Joel Schlessinger makes three recommendations. The first selection is LovelySkin Cream Cleanser, which is an extremely gentle cleanser – and quite effective at removing impurities, plus excess oil and makeup, from the skin. This product also exfoliates your facial skin for a bright even tone, and it removes dead skin cells without over-drying. A key ingredient in this cleanser is Amino Fruit Acids. Dead Sea minerals encourage regeneration of skin cells, while vitamin C stimulates the skin’s natural collagen growth, which minimizes fine lines. This is an ideal product for dry to normal skin. The doctor’s second choice is the NIA24 Physical Cleansing Scrub. The NIA24 Physical Cleansing Scrub is an amazing product, a combination exfoliator and cleanser that removes dry flaky skin to reveal younger-looking skin underneath. This product contains chamomile, oat and sage for their soothing properties and sunflower oil to restore hydration. The product uses Pro-Niasomes (small beads of jojoba, fortified with Pro-Niacin) to rejuvenate skin. You can use the NIA24 scrub two to three times per week and it is ideal for all skin types. For his third choice, Dr. Joel Schlessinger chooses a water-activated cleanser for intolerant skin: La Roche-Posay Toleriane Purifying Foaming Cream. La Roche-Posay Toleriane Purifying Foaming Cream has a creamy texture and creates a smooth, gentle lather to wash away makeup and impurities. This product rinses away easily, is fragrance- and preservative-free, and is perfect for normal to combination intolerant skin. Stayed tuned for information about more of the doctor’s favorite things in upcoming blog posts! Choosing the right moisturizer is key to having younger looking, lovelier skin. To help, Dr. Joel Schlessinger names his three favorite moisturizers. The first choice is EltaMD Lotion, which is an outstanding daily moisturizer that soothes dry, itchy skin. What’s great about this product is that it also strengthens the skin to help fight against damage from frequent hand washing, swimming and cold, dry air. EltaMD Lotion is non-comedogenic (does not block/clog up pores), and sensitivity- and fragrance-free. The second choice is Vanicream Moisturizing Cream, a long-lasting moisturizing cream with no greasy feel. This product spreads easily and is quickly absorbed; it is also non-comedogenic and contains no perfume. The third choice is a product created by Dr. Joel Schlessinger himself: the LovelySkin Healing Face Balm, fragrance-free. 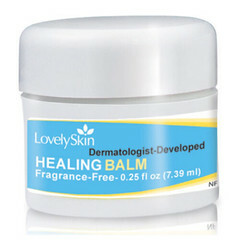 The LovelySkin Healing Face Balm soothes chapped, dry skin and is ideal for sensitive skin and all other types. The moisturizing formula stays solid at higher temperatures. The article points out that, if you have dry skin, you could benefit from applying moisturizer several times a day; meanwhile, someone with oily skin might only need a lightweight moisturizer once a day. Read this article for more specifics. Watch for more product recommendations by Dr. Joel Schlessinger! Dr. Joel Schlessinger recommends his favorite sunscreens so that you can prepare for the upcoming season. Dr. Joel Schlessinger shares his favorite three sunscreen products, starting with La Roche-Posay Anthelios 60 Ultra Light Sunscreen Fluid. This product is outstanding for acne prone skin and it absorbs quickly without leaving a greasy residue; it’s also water-resistant. La Roche-Posay Anthelios 60 Ultra Light Sunscreen Fluid is perfect to wear under makeup, leaving your skin with a matte finish. This sunscreen contains proprietary ingredients proven to protect your skin, including Cell-Ox Shield (sun filters/antioxidants) and Senna Alata (antioxidant from a tropical leaf extract to build a natural defense against UV rays). Here’s another one of the doctor’s favorite sunscreens: Elta MD UV Clear SPF 46 Very Light Sunscreen. EltaMD UV Clear SPF 46 Very Light Sunscreen is ideal for oily skin and is another excellent choice for acne prone skin. The product contains zinc oxide for protection against the sun, along with niacinamide as a soothing acne skin care solution. Consider Elta MD UV Clear if you have sensitive or inflamed skin. Because it is fragrance free, paraben free and non-comedogenic, it’s an excellent choice for you and it works well under makeup, too. 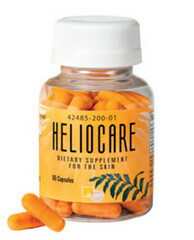 Yet another recommended product is Heliocare Sun Protection Pills. This revolutionary product protects you from the sun – inside out. You simply need to take one pill a day to strengthen your body’s natural defenses against harmful UV rays. Heliocare Sun Protection Pills are the only dietary supplement with the ability to help protect the skin against UV rays and to help slow down sun-related aging. The active ingredient is Polypodium Leucotomos extract. Note that you should still apply a topical sunscreen.